You’ve just spent 45 minutes building a fire, wrapping potatoes in tinfoil, filling that Dutch oven with beautiful, finely chopped veggies and getting everything cooking. The hard part is done. Now, the wait. Instead of just sitting there and drooling while you watch your food cook, give those legs a stretch and bust out a classic camp spot time killer -- yard games! 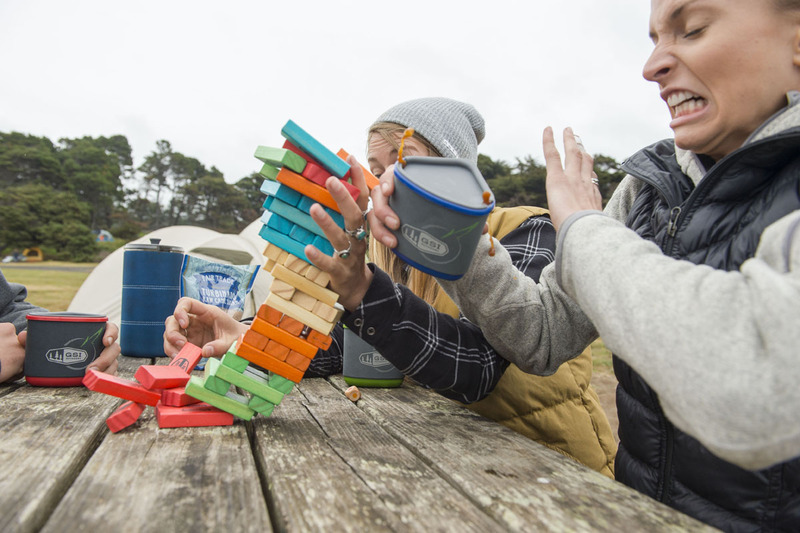 Adding a few yard games into your camping kit is the perfect way to stretch the legs and get the blood moving -- particularly beneficial after a big day on the trail or water. As an added bonus, yard games are “adult beverage-friendly” by nature, so you can get your party on and sip a beer or cocktail while you try to school your campmates. It sure beats sitting around listening to your friend’s latest rendition of Lady Gaga on their backpack flute. Nobody wants to hear that. Literally nobody. Nothing dampens your spirits (both literally and figuratively) like a rainy day while camping. But a quick mood-booster can be found by adding a little friendly competition. When space is limited, bust out the Backpack Tumbling Tower set. All you need is a level surface and a little competitive spirit. If cards are more your style, it’s tough to beat a good, trusty cribbage board. It takes a minute to learn the game but once you’ve got it down it’s hard to stop. You’ve risen from your sleeping bag but you’re not quite ready to take on the prospect of tackling the day until that first cup of coffee hits your lips. We feel ya. But it takes time to filter water, get it on the fire or campstove, grind coffee and let it brew. This is the perfect time for a picnic table game of Tumbling Tower. It starts off nice and mellow but once those blocks start tumbling you’ll shake off those cobwebs quick. These are the perfect games to not only kill some time while you’re waiting for lunch or dinner to cook but also exploring the area in and around your campsite. We’re talking table tennis, freestyle horseshoes and all-terrain bocce ball. Picnic Table Tennis is perfect for the competitive spirit in all of us. The picnic table surface adds an extra element of surprise and you can always add a few cups of beer to the table for an impromptu game of beer pong. Freestyle Horseshoes bring an extra element of fun to a classic yard game. The rubber mats mean the posts can go almost anywhere -- mix it up and skip the level playing field and opt for some hillside trickery. All-Terrain Bocce Ball is the reigning king of fun campsite games. There are general rules (throw the jack ball (a.k.a. the marker ball) and throw, bounce or roll the others to see who gets closest) but adding your own twists makes the game even more fun. You can cover some major ground in a friendly game of bocce. Just make sure to bring a backup beverage if you're taking the game on the road and venturing away from the campsite. Pro Tip: For added portability, there’s even a freestyle disk bocce set and a backpack-friendly bocce set that is light enough to bring into the woods when you’re miles from civilization (or your vehicle). Next time your group finds itself staring at a campfire feeling like you’re all watching paint dry, reach into the trunk and pull out a yard game or two and blow some minds. You’ll definitely be the hero of the trip!